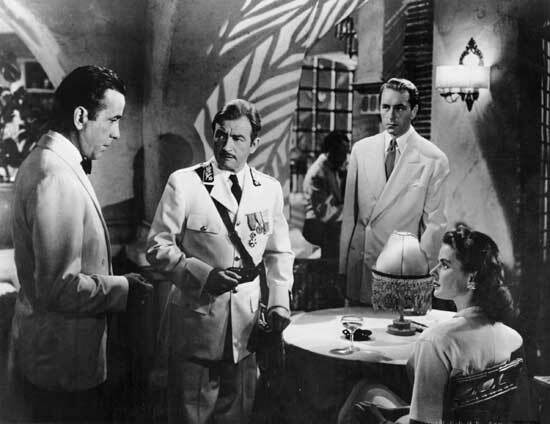 The classic wartime romantic melodrama Casablanca has been tested by time and passes with flying colors. An accidental success of the studio system assembly line, it carries as much weight today, if not more, as it did in 1942. Its poignant and stirring love story is timeless and eternal. The rich and smoky atmosphere and chiaroscuro lighting, the lush black and white cinematography, and main themes of loss, honor, self-sacrifice and redemption in a chaotic world perfectly reflected the dark and pessimistic WWII social climate, and are still perfect seventy years later. Rick Blaine’s (the unimitable Humphrey Bogart) tough, cynical, and efficient exterior is an imperfect armor, barely covering the core of sentiment and idealism. His ultimate sacrifice in the service of something greater than himself is instantly appealing. He becomes a true romantic hero worthy of the other characters’ and the audience’s admiration. The emotional effect on viewers warming in the glow of Rick’s gallant heroism is the thought that perhaps we too could achieve greatness through great sacrifice. The film’s ending is not happy, but it is hopeful. True love does not conquer all. It does, however, elevate its characters to higher levels of humanity. And this stands at the core of Casablanca, distinguishing it from the majority of noir films that chronicle the dark side of human nature, basking in their own deep shadows of gloom and disenchantment. The movie dares to rise above the dark atmosphere of the war years, demonstrating that nobility and honor are still alive and well, and run a café in the unoccupied French province of Morocco. ***This is a short analysis of the film. It contains spoilers. Casablanca is not a film noir per se, but it reflects many elements of the genre, mainly its setting, mood, cinematic style, and typical romantic lone hero. 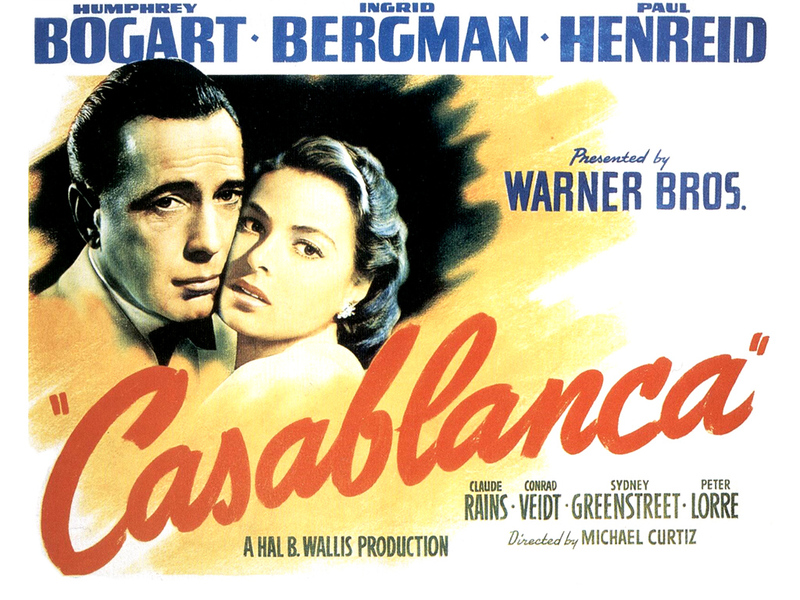 Most of the action takes place in the title city of Casablanca. The urban environment of transients is over-crowded and decadent, a hotbed for crime and corruption in which the hopefuls wait for their chance to escape to Lisbon, eyes expectantly drawn to the sky (“Perhaps tomorrow we’ll be on that plane”) and the less fortunate steal, beg, bargain, and otherwise traffic in human misery. The men and women who stop in Casablanca on their way to a better life never want to be there. The war affects everyone: “the leading banker in Amsterdam is the pastry chef; his father is the bellboy,” a loyal employee of Rick’s informs a customer. The police force, represented by Nazi-collaborating, corrupt official Capt. Luis Renault (Claude Rains), knows that “human life is cheap,” and so is honor. Cops round up suspects even when they already know who committed the crime, shoot people and then decide whether to call it suicide or resisting arrest, expect to win at roulette tables in illegal establishments, ask for sexual favors in return for signing documents, and generally “blow with the wind” in providing support. Signor Ferrari (Sydney Greenstreet), as leader of all illegal activities in Casablanca, holds a very high position of influence and is considered “respectable.” In a world in which crime is a daily constant and the corrupt prosper, in which man-made laws are meaningless, the good and just must abide by laws higher than themselves. In the world of Casablanca feelings and concern for others are dangerous. The lone outsider hero sticks “[his] neck out for nobody,” because that is the safe thing to do. A tough and cynical shell is a wise defense mechanism. The movie’s protagonist doesn’t let on too much about himself; his eyes are brown (“really?”) and his nationality “drunkard.” He has no past—last night is “too long ago to remember”—and no future—tonight is too “far in advance.” He has been hurt and is by choice an exile in Casablanca. We know he is an American, but people speculate about why he left the country, with theories ranging from “[absconding] with the church funds” to “[running] off with a senator’s wife,” to having killed a man. The protagonist gives nothing away, claiming it’s actually “a combination of all three,” and assuring Capt. Renault he came to Casablanca for the waters: “The waters, what waters? We’re in the desert.” Rick was “misinformed.” He projects a façade of mystery and disinterestedness and hides behind heavy clouds of cigarette smoke because he wants to forget what happened with Ilsa (Ingrid Bergman) in Paris, although he remembers every detail: “the Germans wore gray, you wore blue.” Rick objects to the shady surroundings, activities and “cut-rate parasites” of the city and is sometimes disdained by his own occupation, calling his Café Americain a saloon. The cynical veneer is easy to see through as soon as his lost love walks into his café, “out of all the gin joints in all the towns in the world.” When he says he’s the only man he fights for these days, one wonders whether he is trying to convince Renault or himself. The French official always suspected Rick was “at heart a sentimentalist.” His transition from a cynic to an idealist is conveyed cinematically through the brilliant development of the low-key lighting. In the earlier scenes, when we believe he is a part of the mercantile underworld of the city and only cares about his profits, he if often harshly lit, or lit from beneath by the light of a lamp or match, appearing sinister. As he starts to open up, and we discover his relationship with Ilsa through a series of flashbacks, his face is more softly lit. When the leader of the underground movement and concentration camp escapee Laszlo (Paul Henreid) encourages the entire café to sing the Marseilles in a rousing scene, a close-up of Ilsa’s face demonstrates that she remembers why she loves this man, although quite differently than she does Rick. In the end, she gets on the plane with Victor Laszlo, “where she belongs.” She also sacrifices her own happiness for a better cause. In this way, all the main characters are redeemed. Even Capt. Renault, by deciding not to arrest Rick for killing Maj. Strasser (Conrad Veidt), and symbolically throwing the bottle of Vichy wine away, discovers his backbone and straightens his moral compass. This one good act atones for all the petty crimes he has committed. 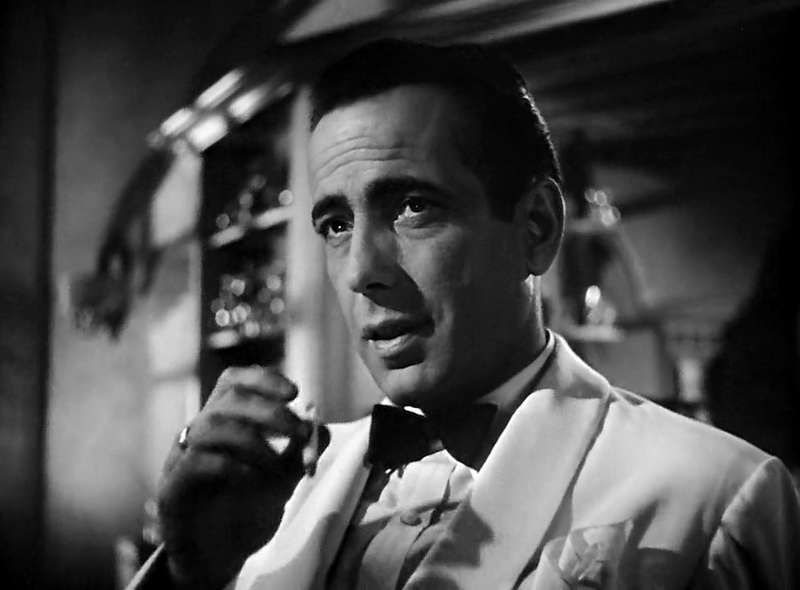 The setting and plot of Casablanca don’t have much to do with reality, but then again, not a lot of the best noir films do. Shot mostly in the studio, in a pure, dreamlike black and white world of light and shadow, the film projects its own image of the troubled war years. It is a testament to its greatness that it is still as loved today as it was in that time. Its characters are unforgettable and timeless, its lines infinitely quotable (“Here’s looking at you kid”). 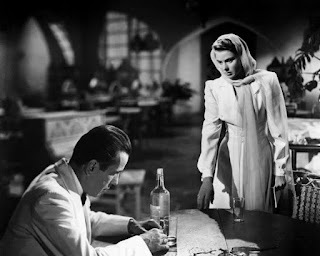 According to Casablanca’s hero, “the problems of three little people don’t amount to a hill of beans in this crazy world,” but Rick and Ilsa’s problems certainly amount to a hell of a lot more than a hill of beans for the viewers. I did a review on this, it is on my Chanel. Please check it out. I like watching movies too and browsing for good site.